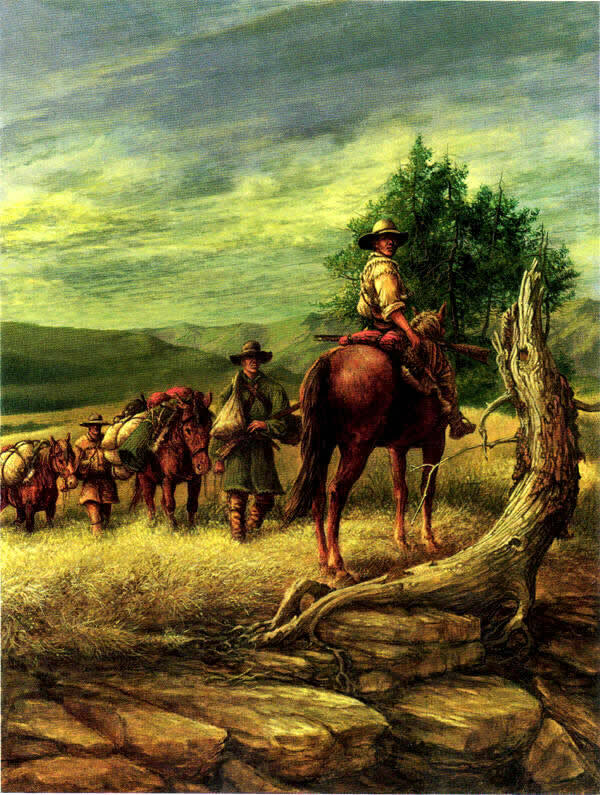 "The Last Of The Longhunters"
As the vast quantities of fur-bearing animals east of the Appalachian Mountains became depleted by market hunters and farmers in the mid to late 1700”s, hunters became long hunters and extended the duration and distance of their hunting trips. It became common for a few men and their packhorses to be gone for as much as a year at a time, with no guarantee of success. Since there were no “hunting seasons or game limits”, deer and buffalo quickly became hunted out. Dressed deer hides were then commonly used as currency on the frontier and each skin was valued at one dollar, or “one buck.” “The year of the hard winter”, in 1779/80 was the cause of much hardship for the settlers. The weather was so severe that turkeys froze while roosting in trees and fell to the ground; deer, buffalo and cattle starved to death; unable to eat frozen, sleet covered cane and vegetation. Frontiersman, Simon Kenton stated: “Kentucky’s game herds were never so great—thousands of deer and buffalo perished.” The era of the classic longhunter as we know it, lasted a relatively short period of time. A few old timers continued their way of life into the 1800’s, but the longhunting way of life which began in the mid 1700’s with people like the Harmon brothers, John Findley, Elisha Walden and the Boones, generally came to an end by 1780 when the Tennessee, Kentucky and Missouri territories became settled. Daniel Boone moved from Kentucky and eventually relocated in the Spanish Missouri Territory, west of the Mississippi River, and in 1817, at eighty-four years of age, went on what would become his last long hunt to the cold, blustery Missouri prairie. Boones’ son Nathan stated: “Father was exhilarated to be camping out again. He had brought his gun, his kettle, a light axe, provisions and two or three traps. He seemed to feel himself in his ancient element. After the evening meal, he told stories of his olden time adventures”. The era of the longhunter was ending, but the time of the beaver trapping mountain men of the 1830’s and 1840’s was just beginning.